British Prime Minster said it is “unthinkable" that Britain would launch military action against Syria if there was strong opposition at the United Nations Security Council, as British jets deploy to Cyprus. Prime Minister David Cameron told the House of Commons in a debate on Syria on Thursday that Britain would not enter into military action until the UN inspectors report back, until MPs take a second vote and until there is backing from the Security Council in the United Nations. The prime minister also said, however, that it was inconceivable that Britain should do nothing in the face of the use of chemical weapons. Cameron said that while there wasn’t a “smoking gun” of evidence that Assad had used chemical weapons, the evidence was substantial. Supporting military action was a judgment call, he said. Britain’s government has published internal legal advice and intelligence, saying it is entitled to take military action in Syria, even if the UN Security Council votes against it, as Typhoon jets deploy to Cyprus. Earlier Thursday, the British government claimed that military action in Syria without UN approval was legal and justifiable, in the clearest indication yet that military intervention in the country is in the cards. “Military intervention to strike specific targets with the aim of deterring and disrupting further such attacks would be necessary and proportionate and therefore legally justifiable,” a copy of the British government legal position read. “If action in the Security Council is blocked, the UK would still be permitted under international law to take exceptional measures in order to alleviate the scale of the overwhelming humanitarian catastrophe in Syria,” the document continued. The UK government also released a letter from the Joint Intelligence Committee that said there were “no plausible alternative scenarios” except that forces loyal to Assad had perpetrated the chemical attack near Damascus. “We also have a limited but growing body of intelligence which supports the judgment that the regime was responsible for the attacks and that they were conducted to help clear the opposition from strategic parts of Damascus,” the letter continued. 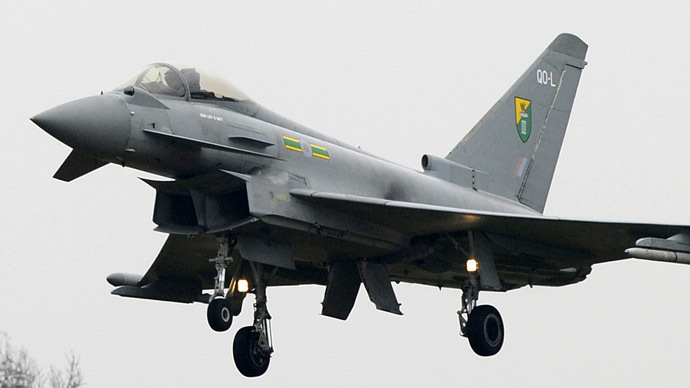 Britain’s Defense Ministry confirmed Thursday that six Typhoon fighter jets had been sent to the Royal Air Force base in Akrotiri in Cyprus as a “prudent and precautionary measure.” The ministry insisted they were not being sent there to take part in any military strike against Syria. “We can confirm that as part of ongoing contingency planning, six RAF Typhoon interceptor fast jets are deploying this morning to Akrotiri in Cyprus,” a ministry spokesman said. Around 2,500 British military personnel serve at the Akrotiri base in Cyprus. Typhoon jets are primarily air defense fighters and are fitted with medium range air-to-air missiles and short range air-to-air missiles, although the jets can also be used in a ground attack role. The Turkish government’s crisis management center also announced Thursday that officials had designated bunkers along the country’s border with Syria to protect people in the area. Israeli citizens have been issued gas masks by the government in the coastal city of Haifa in northern Israel over fears of reprisal strikes from neighboring Syria. As the military buildup continued, the leader of Britain’s opposition Labour Party, Ed Miliband, backed off from supporting the government on military action, saying his party would need “compelling evidence” of chemical warfare. “I didn’t think that the decision should be made on an artificial timetable when the House of Commons wouldn’t even have seen the evidence today from the UN weapons inspectors,” Miliband added. Meanwhile, Nick Clegg, the Deputy Prime Minister, whose Liberal Democrats party opposed the war in Iraq in 2003, said the government was “bending over backwards” to address public concerns about intervention in Syria.